Are you considering buying or hiring a reach truck? To help you in your decision we have provided some basic information that will help you in understanding their specific application. The Hyster R Series is the ultimate reach truck. Reach trucks are designed to work in narrow aisle warehousing spaces. They have two outer legs that distribute the load weight; with a wheel configuration of two or one wheels per leg. The drive wheel is located under the operator’s seating position. The driver sits sideways when operating the machine. The wheel base of a reach truck is the same length as a normal counter-balance forklift; however the body is more compact. When lifting a load a reach truck moves the load back within the wheelbase; meaning less of the load is protruding from the reach truck, allowing the reach truck to work in much narrower aisles. Check out our warehouse racking information section or our double deep racking configuration diagram. A Pantograph Reach Truck uses a scissor design reach mechanism to extend the lifting forks forward, allowing it to reach into racking with either a double or a single reach configuration design. These reach trucks are designed to drive into the racking to load pallets therefore racking configurations must be arranged to have no bar on the bottom level with bottom pallets being loaded directly onto the floor. Another option for racking configurations is to employ the use of smaller wheels with a higher bottom bar configuration to allow for the reach truck to move forward under the racking bottom bar. It is also important to note that pantographic reach trucks have a higher lifting capacity when fully extended at double deep reaching. A Moving Mast Reach Truck uses a hydraulic system; based on rails that allow the entire mast to move forward. A moving mast reach truck’s key disadvantage is that it is unable to handle double deep racking without a fork extension attachment. These trucks come standard with larger-diameter wheels giving them greater ground clearance, often enabling them to operate dockside as well as in narrow aisles. A Reach Straddle Truck is an uncommon configuration of either type of reach truck. This allows the unit to straddle the pallet (meaning the legs are set apart wider so that the unit legs can surround the pallet). This type of configuration is not recommended as it means that pallets cannot be as closely stacked resulting in increased required storage space. 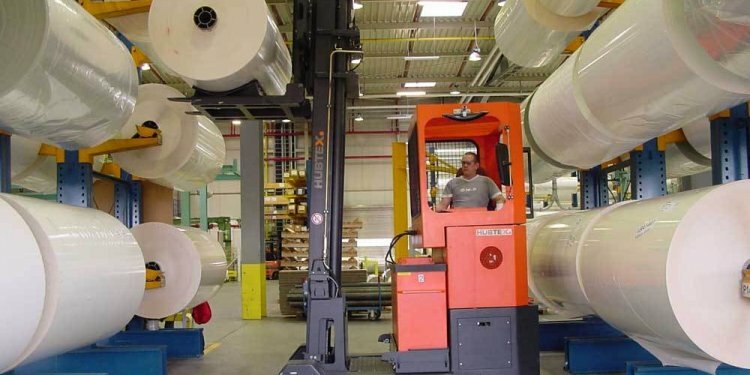 Here we have included some frequently asked questions about reach trucks. Can a reach truck work outside? Yes, with sufficiently flat floors; but they are battery electric powered equipment so they are unable to work in the rain. If larger wheels are fitted they are able to work on higher incline ramps due to higher ground clearance. Does the driver always sit sideways? Yes, the driver sits sideways, as this leads to improved operator comfort and control due to working in narrow aisles. What are the advantages of the moving mast reach truck compared to pantographic? Both types of reach truck are very similar but the pantographic is able to handle double deep racking applications where as moving mast requires an attachment to handle double deep racking. Pantographic reach trucks have a higher lifting capacity when fully extended at double deep reaching; compared to a moving mast reach truck with fork extenders. Can reach trucks load trucks with pallets? Yes, a reach truck can also be used for counter-balance forklift applications and can be fitted with attachments for specialised lifting jobs. Choosing the right narrow aisle equipment and racking can be a complicated and difficult task. Contact us today and one of our experienced staff will guide you through the process ensuring you get the best configuration for your specific application needs.